416 pages | 191 Color Illus. Written by one of the foremost experts in high-performance computing and the inventor of Gustafson’s Law, The End of Error: Unum Computing explains a new approach to computer arithmetic: the universal number (unum). The unum encompasses all IEEE floating-point formats as well as fixed-point and exact integer arithmetic. This new number type obtains more accurate answers than floating-point arithmetic yet uses fewer bits in many cases, saving memory, bandwidth, energy, and power. Richly illustrated in color, this groundbreaking book represents a fundamental change in how to perform calculations automatically. It illustrates how this novel approach can solve problems that have vexed engineers and scientists for decades, including problems that have been historically limited to serial processing. The book is accessible to anyone who uses computers for technical calculations, with much of the book only requiring high school math. The author makes the mathematics interesting through numerous analogies. He clearly defines jargon and uses color-coded boxes for mathematical formulas, computer code, important descriptions, and exercises. "The author of the present book believes that it is time to supplement the century-old floating point arithmetic with something better: unum arithmetic. The book covers various operations with unum arithmetic and topics like polynomial evaluation, solving equations, two-body problem, etc. The appendices give a glossary of unum functions, ubox functions, and some algorithm listings." "This book is an extraordinary reinvention of computer arithmetic and elementary numerical methods from the ground up. Unum arithmetic is an extension of floating point in which it is also possible to represent the open intervals between two floating point numbers. This leads to arithmetic that is algebraically much cleaner, without rounding error, overflow underflow, or negative zero, and with clean and consistent treatment of positive and negative infinity and NaN. These changes are not just marginal technical improvements. As the book fully demonstrates, they lead to what can only be described as a radical re-foundation of elementary numerical analysis, with new methods that are free of rounding error, fully parallelizable, fully portable, easier for programmers to master, and often more economical of memory, bandwidth, and power than comparable floating point methods. The book is exceptionally well written and produced and is illustrated on every page with full-color diagrams that perfectly communicate the material. Anyone interested in computer arithmetic or numerical methods must read this book. It is surely destined to be a classic." 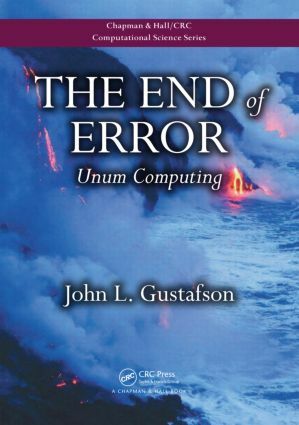 "John Gustafson’s book The End of Error presents the ideas of computer arithmetic in a very easy-to-read and understandable form. While the title is provocative, the content provides an illuminating discussion of the issues. The examples are engaging, well thought out, and simple to follow." "John Gustafson presents a bold and brilliant proposal for a revolutionary number representation system, unum, for scientific (and potentially all other) computers. Unum’s main advantage is that computing with these numbers gives scientists the correct answer all the time. Gustafson is able to show that the universal number, or unum, encompasses all standard floating-point formats as well as fixed-point and exact integer arithmetic. The book is a call to action for the next stage: implementation and testing that would lead to wide-scale adoption." "Reading more and more in [John Gustafson’s] book became a big surprise. I had not expected such an elaborate and sound piece of work. It is hard to believe that a single person could develop so many nice ideas and put them together into a sketch of what perhaps might be the future of computing. Reading [this] book is fascinating." "Almost infinite" and "beyond infinity"
How can appending extra bits save storage? Are floats "good enough for government work"? Can ubounds save storage compared with traditional floats? Hardware for unums: Faster than float hardware? Equal, nowhere equal, and "not nowhere equal"
Nested square roots and "ULP straddling"
Exp(x) and "The Table-Maker’s Dilemma"
A definition of answer quality and computing "speed"
Another Kahan booby trap: The "smooth surprise"
What does it mean to "solve" an equation? Dr. John L. Gustafson is an applied physicist and mathematician. He is a former Director at Intel Labs and former Chief Product Architect at AMD. A pioneer in high-performance computing, he introduced cluster computing in 1985 and first demonstrated scalable massively parallel performance on real applications in 1988. This became known as Gustafson’s Law, for which he won the inaugural ACM Gordon Bell Prize. He is also a recipient of the IEEE Computer Society’s Golden Core Award. Find more details on his website.